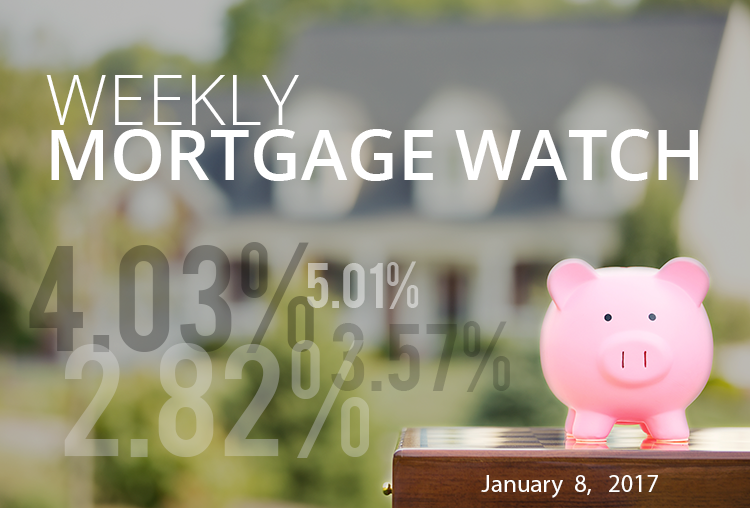 The New Year began with some relief for mortgage shoppers, as mortgage rates slipped downward, even with positive economic news. A retraction, after a sharp increase, is not terribly uncommon, especially when the upward movement appears to have been based more on emotional elements than technical ones. Of course, the economy is continuing to improve, and this will help keep rates from falling very far, if at all. The ISM Manufacturing and Services Indices posted solid results, while another 156K jobs were created last month. It is worth noting that monthly employment data also sported an increase in wages which resulted in 2016 being the best year for wage growth in the last 7. Increasing wages are often a predictor of future inflationary pressures. Given the strong data from last week and the market’s generally optimistic attitude, it is unlikely that rates will fall much next week. The majority of the important economic data is due on Friday, and if we get another round of solid economic data, rates will be tempted to start moving back upwards. In a growing new twist on mortgage fraud, some buyers have figured out how to inflate their income to qualify for larger loans. These buyers pose as investment buyers who state that they are planning to rent out the home that they are buying. Then they actually move into the home, as their primary residence, after the loan closes. The trick is that they are able to claim the “expected” rental income on the property as part of the qualifying process, enabling them to qualify for more. How Will The Real Estate Market Perform In 2019? Coldwell Banker Residential Brokerage | Owned by a subsidiary of NRT LLC.